Is the MOECC interpreting Environmental Tribunal rulings? The Ontario Ministry of the Environment and Climate Change (MOECC) recently responded to a citizen of Prince Edward County, who wrote with concerns about German-based power developer WPD’s published construction schedule. The schedule appears to ignore stipulations put in place by the quasi-judicial Environmental Review Tribunal to protect the endangered Blandings Turtle, which is resident in the County, and the area where nine industrial-scale wind turbines are under construction. “The REA restricts construction and maintenance activities within Blanding’s Turtle habitat to between October 15 and April 30 where possible. If construction and maintenance activities between May 1 and October 14 are unavoidable, the company must ensure additional measures are in place to avoid the Blanding’s Turtle and that its actions do not cause an adverse effect to the natural environment, including the Blanding’s Turtle. “Construction of the nine turbines began on September 18, 2017. On September 21st and, in reference to the REA, the MOECC requested that construction stop in areas of Blanding’s Turtle habitat until October 15th, unless wpd White Pines Wind Inc. was able to prove the work was unavoidable. Construction continued in areas not identified as Blanding’s Turtle habitat per the REA. Not very clear language from the MOECC, whose job it is to protect the environment, not aid and abet power developers. However, those conditions are being ignored, so the Protect Amherst Island community group has written to the Ministry demanding that their own rules be enforced. Once again, Ontario citizens are fighting to protect the environment from the Ministry of the Environment. The keynote speaker was Mr. David Stetzer, an electrician with 30 years of experience. Mr. Stetzer specializes in power control in industry, municipalities, and motor control centres. For the last decade, he has focused his attention on power quality analysis and troubleshooting. He is a senior member of the IEEE (Institute of Electrical & Electronic Engineers), has qualified as an expert witness in litigation suits in ground currents and power quality, is co-author of peer-reviewed papers in journals, as well as being a producer of the documentary ‘Beyond Coincidence: The Perils of Electrical Pollution’. Stetzer attributes much of the dirty electricity — frequently referred to as “stray voltage” that exists in Ontario — to the overloading of the single return wire in our power supply. Eighty percent of the power that returns to the substation is “dumped” onto the ground. We do not see, hear, feel, taste or smell electromagnetic energy. Yet the proliferation of electrical pollution creates problems for people who have a biological reaction to the poor power quality that is generated by industrial wind turbines, power transmission lines and distribution lines. Ontario’s Eco Commissioner or ECO, environmental lawyer Dianne Saxe, long known for her support of wind power development, has issued a very unusual and interestingly timed report. Making Connections: straight talk about electricity in Ontario is an unabashed defence of the Ontario government’s energy policy, even with its criticism that government has not done enough. We will leave it to others to comment on the statements about electricity demand, the supply mix, and whether selling off surplus power actually costs Ontario taxpayers and electricity ratepayers, but when it comes to the issue of the health impacts of wind turbines, we have no choice but to call out the Commissioner’s (deliberate) exclusion of the facts. While acknowledging that there are some negative impacts from wind turbine construction and operation, such as the building of access roads, and the effect of turbines on bird and bat populations, when it comes to effects on humans, the ECO relies on a lawyer’s view of the evidence, which to her, is strictly the results of appeals before the quasi-judicial Environmental Review Tribunal or ERT. What ECO Saxe neglects to say is that the basis on which to win an appeal on health before the ERT is virtually impossible. One of the prime effects of exposure to the range of wind turbine noise emissions is sleep disturbance or sleep deprivation, which is widely acknowledged as a source of health problems such as high blood pressure, altered blood sugar levels, and annoyance or distress, which is in itself an adverse health impact. The situation in Ontario is that the moneyed wind power interests could afford to hire expert witnesses to support their side, while the appellants in these cases could usually only manage to have beleaguered citizens with their anecdotal reports of health effects. Any health care professionals who did venture forth to support these claims were badgered and had their professional qualifications questioned, sometimes merely on the basis of where they lived. ECO Saxe asserts that there is extensive evidence and that there are numerous studies from around the world supporting the claim that there is no link between wind turbine noise and health effects. In Ontario, Wind Concerns Ontario obtained thousands of reports from people living near wind turbines (in some cases, among them) via a request under the Freedom of Information Act process. WCO received over 4,500 records (though this number is almost certainly not complete) of complaints filed with the government since 2006. The number of complaints is significant, but so too are staff notes in these documents. In total, explicit reference to the presence of health impacts from wind turbine noise emissions or environmental noise from the turbines was present in 35 percent of the reports we received. We cannot help but question the political nature of this document. The ECO actually says, “the ECO strongly believes that fossil-fuelled generation, including the gas-fired generation that operates in Ontario, is more harmful to the environment than other electricity sources.” (page 150) In other words, there might be some problems but we have to accept them because the alternative is worse. This is preposterous and flies in the face of the government’s mandate to protect both health and the environment. Indeed, as a team of academics noted in their 2016 paper published in Nature Energy on how wind power problems were handled in Ontario, Ontario “public policy takes an ‘innocent until proven guilty’ view of [wind turbine noise and health] evidence rather than a more precautionary approach. … there is epidemiologic evidence t sustain various interpretations of wind turbine impacts on well-being.) Fast et al, Lessons learned from Ontario wind energy disputes, page 2). One of the ECO’s goals is to ensure that the government of Ontario receives “fair, balanced and accurate information”. The Environmental Commissioner of Ontario has failed in that goal, and failed the people of rural Ontario who have been forced through political ideology to live in the midst of huge power plants that do produce environmental noise, and are linked to serious health impacts. Noise abatement plan accepted, but what does it really mean? 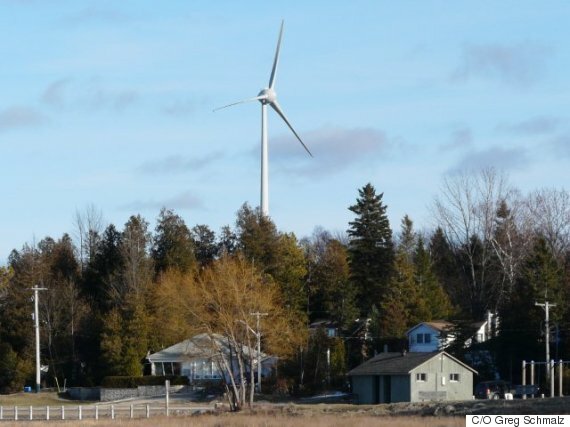 Port Elgin residents forced to live near the single wind turbine operated by the union Unifor, which has resulted in hundreds of noise complaints since the moment it began operating, were “vindicated” recently when the Ontario Ministry of the Environment and Climate Change (MOECC) announced that noise testing revealed the turbine was not in compliance with regulations. See a report from CTV London reporter Scott Miller, here. The MOECC told Unifor that as the turbine operator, they would have to put a noise abatement plan in place by today. Wind Concerns Ontario has learned that the plan was submitted and has been approved by the Ministry. Noise testing will now continue, said MOECC District Manager Rick Chappell, to confirm compliance with regulations. The Ministry expects the new Imissions Audit or I-audit by the end of June. Port Elgin resident Greg Schmalz says the admission of non-compliance is vindication for residents who have been complaining for years, but the fight is not over. And many serious questions remain. The engineering report was filed with the MOECC in January, and the MOECC did not announce the status of non-compliance until March … and then to the wrong municipality. Documents received by Wind Concerns Ontario via Freedom of Information requests show that the MOECC received 236 reports of excessive noise up to the end of 2014, and more during the 2015-2016 time period. People complained of noise “like a helicopter” overhead, and of sleep disturbance at night, which in turn produced other health effects. Read the report by engineering consultant firm HGC here. Eder Dampf Radio in Germany is reporting a spectacular incident in which the rotor blades of an Enercon wind turbine shredded, and threw fiberglass particles over a half-kilometer. Borchen / Paderborn (Gudrun Ponta / nh). Two rotors of a new ENERCON E-115 wind power plant in the district of Paderborn are torn to pieces and cause extensive contamination with innumerable sharp-edged glass fiber particles. At 7pm on March 8th, two rotors of a brand-new ENERCON E-115 wind turbine were completely torn apart – the parts flew over 500m. Neither builder ENERCON nor operator WestfalenWind have informed the public or the police after the incident, although there was danger to their lives due to flying debris. After an Ettelner citizen informed the police, the area around the damaged wind energy plant was cordoned off on a large scale. The barriers of the accident site reached almost to Etteln . On March 6, the wings were mounted, the system was not connected to the mains. Obviously [it] overrun and the wings could not be stopped. It is said that the wings only turned at 19 km / h when they were torn to pieces. ENERCON / WestfalenWind play down the incident – the rotors were merely “broken off” and dropped directly to the ground, it was said in first reports – how can it be that parts have flown over 500m? It is just a lucky coincidence that no one was injured in this spectacular accident of a brand new wind energy plant in Borchen-Etteln. This latest incident again raises concerns about safety around wind turbines, particularly where turbines are located close to highways, as in Chatham-Kent-Essex. UPDATE: Windpower Monthly has a newer version of the story, which may be found here. The wind industry publication notes that an anti-wind power citizens’ group has posted photos of the turbine failure, and claimed debris spread 800 metres—in fact, the group said 500 metres. The Alliance to Protect Prince Edward County (Wind Concerns Ontario community group member APPEC) and the Prince Edward County Field Naturalists (PECFN) submitted a Joint Part IV Application to the Environmental Commissioner’s Office (ECO), regarding the White Pines wind power project. The power project has faced numerous appeals and legal actions over the years, and has been reduced from 29 turbines to 27, and is now at nine. The community had thought that the reduced capacity would result in cancellation of the contract with the Independent Electricity System Operator (IESO) but the IESO simply cut a new contract for the power developer. Concerns about environmental impact remain, however. 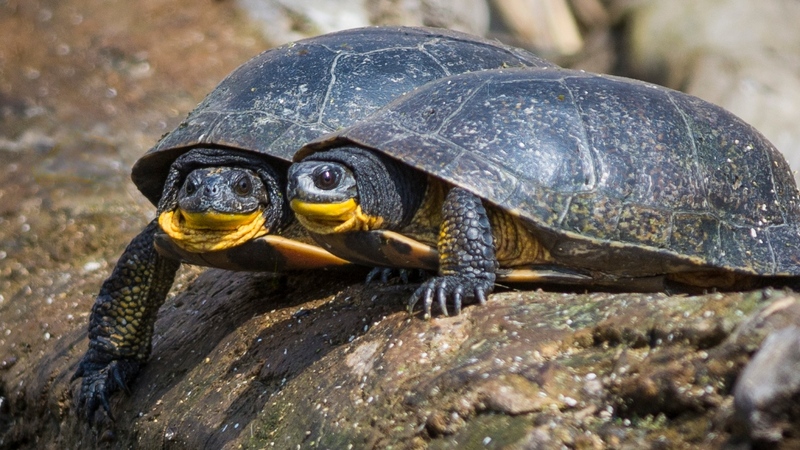 “Basically, we are asking the ECO to conduct a formal review based on the concerns and evidence we have provided relating to the Blanding’s turtle, the Little brown bat and migratory birds,” says APPEC Chair Gordon Gibbins. “It was important for us to submit the Part IV Application before going forward with any appeal to the Divisional Court. Our Application sets this process in motion, and in fact includes almost all the same issues we had planned to raise at the ERT hearing before our appeal was dismissed,” Gibbins explains. The White Pines project has also been fraught with accusations of violations of its Renewable Energy Approval, as the power developer engaged in land clearing and road use outside of signed agreements. Owen Sound District Manager for the Ontario Ministry of the Environment and Climate Change Rick Chappell told West Grey Council and a packed room of citizens today that the controversial single wind turbine in Port Elgin owned and operated by Unifor, is not compliant with provincial noise regulations. A noise abatement plan has been ordered by the Ministry and must be in place by March 18. The Unifor turbine has resulted in hundreds of complaints of excessive noise over the years, several TV news stories, and statements from the local municipality to the effect that the MOECC is failing in its role as a regulator. West Grey Council, which had asked Chappell to appear to answer questions about why wind turbine noise complaints were not being resolved, accepted the news, and one councilor demanded that the MOECC now personally call everyone who had filed a report, and give them the news. Wind Concerns Ontario has reports provided by the MOECC that show 236 reports were filed up to the end of 2014. In the years 2009-2014, over half of the noise reports received by the MOECC got no response. Representatives of three community groups where wind turbine projects are currently under construction, addressed the Wind Concerns Ontario conference in Kingston this past weekend, and told hair-raising stories of violations of Renewable Energy Approvals, disobedience of municipal orders, ignoring conditions of road use agreements, and more. Anne Dumbrille, chair of the County Coalition for Safe Appropriate Green Energy (CCSAGE-Naturally Green) and Orville Walsh of the Alliance to Protect Prince Edward County (APPEC), both based in Prince Edward County, detailed the abuses of the Renewable Energy Approval and IESO contract by Germany-based wind power developer wpd in construction of the contentious White Pines wind power project. The White Pines project was originally planned to produce electricity for Ontario’s surplus-laden power grid via 29 huge wind turbines. A successful appeal based on heritage aspects of The County reduced the turbine number to 27; another appeal (Hirsch v. MOECC) was partially successful and saw the project reduced from 27 to 9 turbines, based on harm to endangered species. The public also expected that while the power project was being appealed, construction work would not be allowed, particularly in the areas presented as habitat for the endangered Blandings turtle, but in fact, both the MOECC and the Ministry of Natural Resources and Forestry allowed it. Only when citizens took action in court was a stop work order achieved. 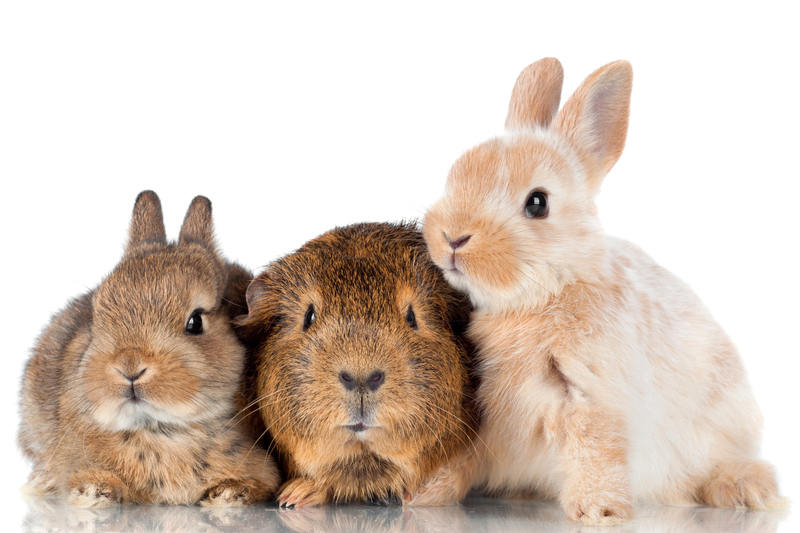 “Why must citizen groups rather than government protect habitat destruction?” Dumbrille asked. The land clearing in turtle habitat continued after the appeal for the nine remaining turbines outside the limits imposed by the Environmental Review Tribunal. Again, citizens went to court, and again a stop order was issued, but not before habitat was destroyed. A transmission station is planned to be built in a stream bed which is against regulations and will require the taking of water. Again, the MOECC appears to side with the power developer on all issues. Janet Grace, past chair of the Association to Protect Amherst Island (APAI), described numerous violations of the Renewable Energy Approval, road use agreements, and provincial safety regulations by “Windlectric” a shell company developing a power project on the island for Algonquin Power. Construction staff and vehicles are supposed to be using a barge to get to the island, she said, but they’re not: instead, they use the passenger ferry which is resulting in delays for Island residents, many of whom work across the water in KIngston, and concerns about safety. 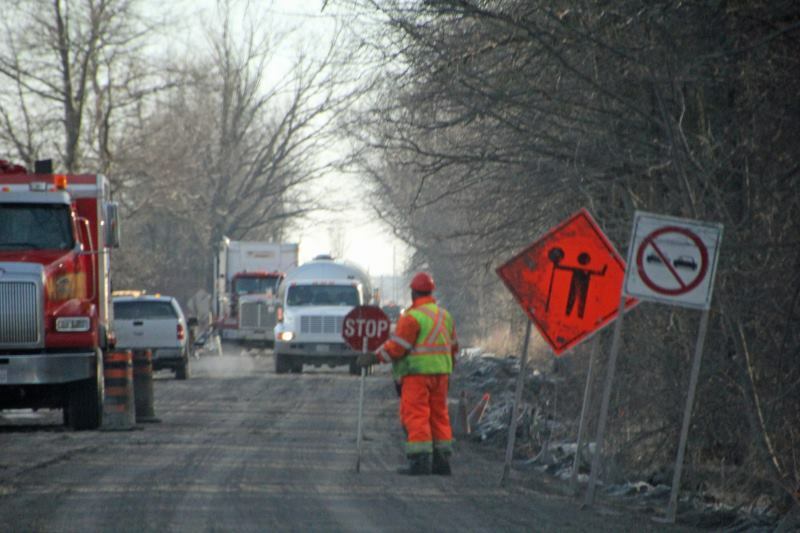 Roads are blocked without notice, and construction throughout the winter has virtually destroyed roads, so much so that the municipality Loyalist Township issued a stop work order. Resident photographs indicate however, that the order was ignored, with the power developer construction firm continuing work. In addition, Grace said, the company is supposed to stop work at 7 PM, but in reality is working until 11 PM. A municipality fighting back against a corporation has won its defence of a lawsuit, and its rights to defend citizens’ water has been upheld. The Precautionary Principle must be applied. This case will be important to Chatham-Kent area residents whose wells have failed during wind turbine construction activity. The Superior Court dismissed the motion of Gastem, which sued the Municipality of Ristigouche-Partie-Sud-Est for $ 1 million. The oil and gas exploration company claimed that the municipal by-law protecting drinking water had forced it to stop its exploration activities in the area. In her decision, Justice Nicole Tremblay states that the by-law “is the result of serious work” and that “Restigouche must ensure the protection of watercourses in accordance with government rules”. The judge ordered Gastem to pay Restigouche-Partie-Sud-Est $ 154,000 within 30 days of the decision. The company will also have to pay $ 10,000 for part of the costs incurred by the Municipality to defend itself. The trial took place in September in New Carlisle, Gaspésie. Restigouche-Part-Southeast welcomes with relief the decision of the court. For four years, the small municipality of 157 inhabitants tried to raise funds to finance his defense against Gastem. The Restigouche Solidarity campaign raised more than $ 340,000. “Today, we raise our glass of drinking water to the health of Quebec’s water and to all those who supported us! “Said the mayor of Restigouche-Part-South-East, François Boulay. According to Mayor Boulay, the bill for the expenses incurred by the Municipality amounts to $ 370,000. The money that Gastem has to pay will be welcome. Should Gastem waive its recourse rights, the surpluses will be transferred to another case for drinking water in Quebec, says Mayor Boulay. The Municipality, however, prefers to wait to hear Gastem’s decision on his right of appeal before disposing of it. The case was very important for other municipalities, since it involved their power to legislate to protect drinking water. The judgment also contains several references to the duty of municipalities to protect the environment and the duty to subscribe to the precautionary principle. Raymond Savoie, president of Gastem, says he is disappointed with the judgment. “We read the document, we try to understand; for the moment we are there, “says Savoie, who refuses for the moment to comment on the decision. Mr. Savoie does not rule out the possibility that the company can appeal the decision, but prefers to wait for a more detailed analysis of the judgment. In the region, Sylvain Roy, MNA for Bonaventure, is pleased with the verdict. The deputy Roy believes that this is a “great victory for democracy and territorial sovereignty”. Mr. Roy hopes the decision will serve as case law for similar cases. The fact that the court recognizes this element of law is also very important, according to Mr. Girard. “It will force companies who want to sue municipalities to think twice if it is not legally sound,” he says. For the lawyer, the victory is indeed that of a small municipality struggling with a pursuit that had no other purpose than to be punitive. “You have to think about it, there are 84 taxpayers in Restigouche! Says Girard. Mayor Boulay also believes that the judgment brings very important elements on the municipal competences in environmental matters. The president of the Quebec Federation of Municipalities (FQM), Jacques Demers, also welcomes the fact that the judgment reaffirms the municipal powers and their duty to intervene in the protection of the environment. “However, we must not forget that these powers must be exercised in compliance with the legislative framework in force,” says Demers.